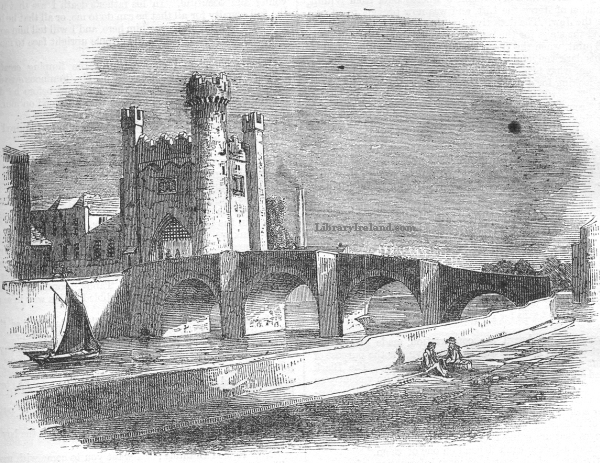 PRIOR to the erection of the present iron bridge over the Liffey, connecting Ellis's-quay and Usher's-island, which was opened for traffic during the recent visit of the Queen to Dublin, when it received the name of "Victoria Bridge," the river here was spanned by a structure properly called "Barrack-bridge," but more popularly known as the "Bloody-bridge." It was originally of wood, and was built in the year 1670, but being found, according to Harris, to interfere with the interest in a ferry which had previously plied in the same locality, a number of the city apprentices assembled riotously, for the purpose of destroying the new erection. Twenty of them were seized and committed to the Castle, but as a military guard was conveying them to Bridewell, they were rescued, and four of their number killed in the fray, from which accident it acquired the name of the "Bloody-bridge." Shortly after this occurrence, the stone bridge shewn in our illustration was erected, consisting of four semi-circular arches, of a very rude character. At its south-western extremity, on the road leading to the Royal Hospital, Kilmainham, was a military gateway, designed by the late eminent architect, Francis Johnston, and built in 1811, under his superintendence. It consisted of a square tower, having smaller square towers projecting from three of its angles, and a circular one of greater diameter and altitude at its fourth or northeastern angle. It lent a most picturesque effect to the old bridge, but when the quays were extended from this, it was found necessary to remove it. This was carefully done, and it now forms the entrance gateway to the grounds of the Royal Hospital, Kilmainham.